A crowd gathered outside of the office of Hamilton County Prosecutor Joe Deters Thursday demanding the release of dash-cam video involving the fatal confrontation between a UC police officer and man during a traffic stop over the weekend. CINCINNATI – With a protester shouting in the background, a local black leader said he sees a "groundswell of anger" developing like the one that led to the 2001 riots over the UC officer-involved shooting and the prosecutor's refusal to release video of the killing. "I'm extremely concerned that this is going to lead to some problems. I don't want to go back to that," State Sen. Cecil Thomas, a former police officer and city council member, said as he stood amid the sidewalk protest outside the county prosecutor's office building downtown Thursday morning. Thomas joined protesters in demanding that prosecutor Joe Deters release the body cam video and more information about the shooting of an unarmed black man, 46-year-old Sam Dubose, by a white officer, 26-year-old Ray Tensing, during a traffic stop in Mount Auburn. Thomas took a megaphone and asked about 20 protesters to "keep the pressure on" while maintaining a "non-violent peaceful protest." Deters has said he would withhold the video until the police investigation was complete and his office decided whether or not to file criminal charges against Tensing. The city announced Wednesday that Cincinnati police had finished their investigation. "I need to see the statement. I need to see the video. Why is the video being held as long as it is?" 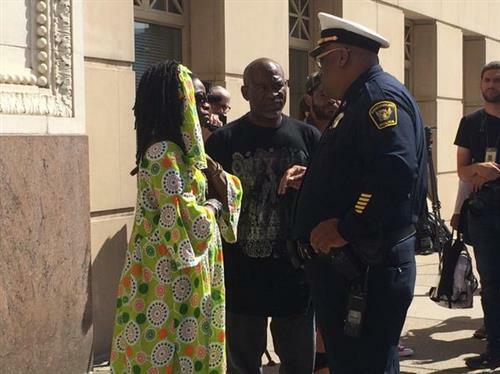 Dubose's fiancée, Abijah Reid, said Wednesday night at a protest at City Hall. Tensing pulled Dubose over for not having a front license plate on his vehicle, UC Police Chief Jason Goodrich said earlier this week. Tensing and Dubose struggled and Tensing shot Dubose in the head, officials said. 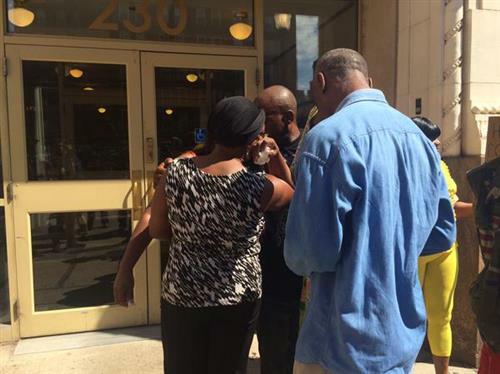 Dubose's family called off a Thursday afternoon meeting with Mayor John Cranley and UC President Santa Ono. At a Wednesday news conference, Cranley and Ono expressed condolences to Dubose's family and revealed plans to meet with them Thursday. Ono also announced that UC would reform its police procedures and consider entering into Collaborative Agreement between Cincinnati police and the Justice Department that followed the 2001 riots. Iris Roley, who was involved in Cincinnati police reforms and was party to the Collaborative Agreement through her work with the Cincinnati Black United Front, seemed encouraged by Ono's and Cranley's pledge of change. But she wants more. "We heard what the prosecutor had to say. We heard what Santa Ono and the mayor had to say, and that is yet to be determined what those reforms will look like," Roley said. "That's a great step, but this family needs some justice."